Eleanor is not a person but a muscle car. 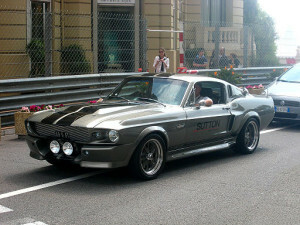 This Gone in 60 Seconds 1967 Mustang is the complete embodiment of what muscle cars are all about. Usually powered by a V8 engine, muscle cars were monsters of drag racing world back in the 1960’s until early portion of 1980’s. With extremely powerful torque, these cars are really going to give you a jaw-dropping ride. Muscle cars are no doubt fast cars with high horse power capability. The moment you look at such cars, the first things you will see are their bulky curves and high-performance z rated tires which are true affirmation of the reputation that muscle autos are very much known of. Muscle cars are different from sports cars we have today though some models are inspired by cars like the Ford Mustang. Though sports cars are fast cars like muscle autos, they surely won’t last a minute with the supreme torque that muscle autos have – which perhaps makes Eleanor the perfect Gone in 60 Seconds car. The interiors of muscle cars are real statement of high performance, road warrior type of vehicle. The almost nil sign of elegance and the all heart-pumping design of muscle autos’ interiors match their rock and revving integrity that many a cars today try to copy but all in futility. The moment you turn it on, you can’t help but notice the fiery breathing of muscle car’s engine. The hissing and guzzling is like that of a dragon sleeping always ready to get the tracks burning. When you hit the gas, the dragon’s V8 engine charges in an instant ready to devour all things that block its way… just like when Vin Diesel of The Fast and The Furious rages against the wall and hits the road with such awesome roar. If what you are looking for is the car with an attitude that never allows being a second rater, muscle autos are the right choice. But prepare to be awestruck with the price because as of now it’s of a collector’s item kind of thing since you can not easily find one in the market. However, there are companies and groups that want to bring back muscle cars on the road and these groups are actually buying old muscle autos and reconditioning them to make them roadworthy again. There are a number of reconditioned muscle cars that can still be found nowadays. There is the all-time favorite 1966 GT 40, 1970 Superbird, 1968 Shelby GT500KR Fastback or 1969 Barracuda Convertible. These models of cars were once kings of the road in the 1960’s up to early part of 1980’s. Although muscle autos are now rare species, there are a number of clubs that relive the greatness of muscle cars. These groups stage races and events all with the purpose of having some fun and reminiscing those days when muscle autos ruled the streets. And thanks to the Internet, people around the world who share common interest in muscle cars now have a dependable means to showcase the glory of muscle autos and allow the younger generation to see the real muscle in high-performance driving via muscle cars. Alex Baumm, member of a car club. Join our Car Club today and find more info on Muscle Cars,Car Purchase etc.